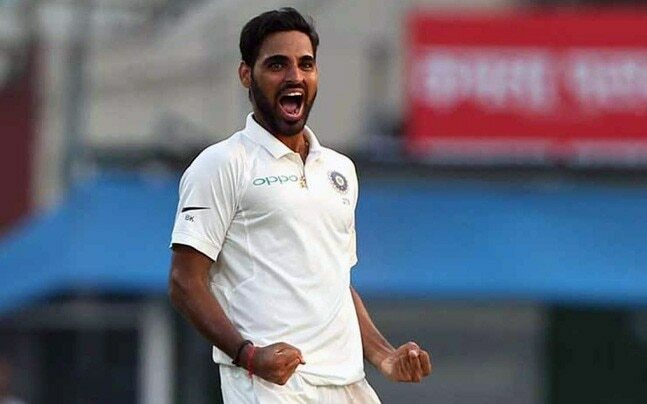 Kolkata, Nov 21: Upbeat after his eight wicket haul in the first Test against Sri Lanka at the Eden Gardens here, India pacer Bhuvneshwar Kumar on Monday said his hard work on fitness is now paying off. Kumar said experience of international cricket has taught him the areas where he needed to improve. The Uttar Pradesh cricketer brought India tantalisingly close to victory with dream figures of 11-8-8-4 in Sri Lanka's second innings. The visitors were 75/7 when bad light brought curtains down on the match. "When I made my debut, I was totally dependent on swing. International cricket tells you what you need to improve on. "I worked hard on my fitness and that is paying off," said Kumar, who had finished with 4/88 in the first innings. Kumar had two years back missed all but one game in Australia during the World Cup. Asked whether the team thought that they could make a match of it when Sri Lanka began the second innings on the final day, Kumar said: "We believed we could win. Virat (Kohli) said 'Imagine we're in this situation overseas. If we get two-three wickets early, it won't be easy for them.'" Drawing comparison between his performances in the two innings, Kumar said the surface posed a tougher challenge in Sri Lanka's second innings. "Frankly speaking, it was tougher to bowl in the second innings as the surface was a lot drier. But the ball was reversing, so that helped," he added.